To Cite: Ghazizadeh M, Yazdani N. Leprosy and Rhinoscleroma: A Rare Case of Concurrence, Arch Clin Infect Dis. 2019 ; 14(1):e63233. doi: 10.5812/archcid.63233. Introduction: Rhinoscleroma and leprosy are two rare infectious granulomatous diseases that can involve the nasal cavity with similar pathophysiologies. It seems that this is the first time that the coexistence of rhinoscleroma and leprosy has been reported in the English literature. Case Presentation: We present the case of a 65-year-old male presented with nasal purulent rhinorrhea, extensive crusts and a large septal perforation. Rhinoscleroma and leprosy were diagnosed histopathologically. Culture results confirmed the diagnosis as well. Complete medical treatment was effective. Conclusions: This case report highlights the importance of possible coincidence of two rare granulomatous infectious diseases with similar pathophysiologies in a patient. Leprosy is a chronic infectious granulomatous disease that mainly involves the skin and nerves (1). It can affect nasal mucosa causing some rhinological symotpms (2). The disease was reported for the first time in the 6th century BC (3). Today, leprosy is rare in non-endemic areas. In 2014, its prevalence rate was 0.24 per 10000 (3). Rhinoscleroma is a chronic, slowly progressive, granulomatous infectious disease that primarily involves the nasal cavity. The first description of skleroma was in 1932, and Klebsiella rhinoscleromatis (KR) was identified as the causative agent in 1882. Nowadays, the disease is rarely found in non-endemic areas (4). To the best of our knowledge, this is the first case report in the English literature that describes the coexistence of leprosy and rhinoscleroma in a patient. Three years ago, a 65-year-old male presented to Amir Alam Hospital (in Tehran) with a crusting rhinitis and foul greenish, mucopurulent nasal discharge. Clinical examination revealed several nodules on his face and trunk as well as loss of eyebrows and eyelashes. Diagnostic nasal endoscopy and computed tomography (CT) scan revealed a large amount of bilateral nasal crusts and a large septal perforation (Figure 1). As Wegener granulomatosis was initially suspected in this case, serologic markers such as cytoplasmic and perinuclear antineutrophil cytoplasmic antibodies (cANCA and pANCA) were checked and the results were normal. Some biopsies from the inferior turbinate mucosa and nasal septum were obtained. Nasal biopsy results revealed diffused lymphoplasmacytic inflammation with large macrophages typical of Mikulicz cell and many Russel bodies. These histopathologic findings were characteristic of the granulomatous stage of rhinoscleroma (Figure 2). Culture of nasal secretions was positive for Klebsiella. Figure 2. Photomicrograph of nasal mucosal biopsy shows the mixed inflammatory process consisting of neutrophils, lymphocytes, plasma cells and Mikulicz cells. The arrows show Mikulics cells. Meanwhile, the presence of multiple and intensely erythematous nodules over the body and his leonine facies were suggestive of leprosy. Multiple skin biopsies were taken and histopathological study confirmed the clinical diagnosis of leprosy. Ziehl Neelsen staining was performed. Microscopic evaluation revealed foamy macrophages infiltration with numerous acid fast bacteria (AFB). For the treatment of leprosy, dapsone 100 mg and clofazimine 50 mg were prescribed daily. The patient was receiving rifampin 600 mg and clofazimine 300 mg under supervision once a month for a year. Treatment of rhinoscleroma was 400 mg of intravenous ciprofloxacin for two weeks followed by four weeks of oral medications. After completion of the treatment, the nasal smear was negative for AFB and Klebsiella, suggesting eradication of both diseases. The three-year follow-up was uneventful. Mycobacterium leprae, the causative agent of leprosy, primarily involves tissue macrophages (2). The first line of defense in leprosy is cellular immunity (2). Neural inflammation is the characteristic finding that helps in differentiating leprosy from other granulomatous diseases. Nasal involvement is common in leprosy (2). Nasal septal perforation is a significant finding in the late stage of leprosy causing saddle nose deformity. Rhinoscleroma is divided based on the clinical signs into three distinct stages, namely the catarrhal stage, the proliferative or granulomatous stage and the sclerotic or fibrotic stage (5). 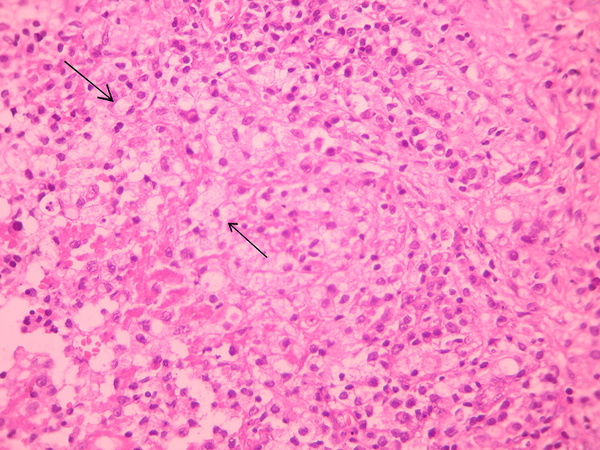 The most characteristic histological finding of rhinoscleroma is formation of Mikulicz cells and Russell bodies, especially in the granulomatous stage (4). Mikulicz cells are large foamy phagocytes with peripheral nuclei and multiple cytoplasmic vacuoles that contain Klebsiella bacilli (5, 6). Russell bodies are eosinophilic inclusions in a plasma cell that undergo synthesis of immunoglobulin (7). Although bacterial culture is positive in 50% of cases in the granulomatous stage (5), the mainstay of diagnosis is histopathological examination. Mikulicz cells is the pathognomonic feature for diagnosis (6). Nasal granulomatous diseases such as leprosy, tuberculosis and Wegener’s disease should be distinguished from the granulomatous stage of rhinoscleroma. The most common site of involvement in rhinoscleroma is nasal mucosa (4, 8). The usual clinical presentation is bilateral nasal discharge and crusts (6). Genetic susceptibility may be a predisposing factor (4, 5). Low socio-economic condition is assumed as a co-factor (9). Impaired cellular immunity and reversal of CD4:CD8 ratio are common pathophysiological findings in both leprosy and rhinoscleroma (5). Although co-involvement of leprosy and other granulomatous infectious diseases (e.g., tuberculosis) has been reported (10), rhinoscleroma has never been described in a patient with any coexisting chronic granulomatous disease, especially leprosy (5). Nasal involvement, the main presentation of rhinoscleroma, is common in both diseases; on the other hand the histologic diagnosis of rhinoscleroma is somehow difficult; therefore, rhinoscleroma may be missed in a patient with coexistence of leprosy and rhinoscleroma. The objective of presenting this case was to highlight the importance of possible coincidence of two granulomatous infectious diseases with similar pathophysiologies. Impaired cellular immunity in leprosy can predispose patients to other diseases such as rhinoscleroma, which involve cell-mediated immunity. Failure to diagnose can lead to residual nasal symptoms despite appropriate treatment of leprosy. Ethical Consideration: The study complies with the current ethical considerations. 1. Baharuddin H, Taib T, Zain MM, Ch'ng S. Leprae reaction resembling rheumatologic disease as presenting feature of leprosy. Int J Rheum Dis. 2016;19(10):1035-8. doi: 10.1111/1756-185X.12916. [PubMed: 27456320]. 2. Suzuki K, Akama T, Kawashima A, Yoshihara A, Yotsu RR, Ishii N. Current status of leprosy: Epidemiology, basic science and clinical perspectives. J Dermatol. 2012;39(2):121-9. doi: 10.1111/j.1346-8138.2011.01370.x. [PubMed: 21973237]. 3. Gupta L, Zanwar A, Wakhlu A, Agarwal V. Leprosy in the rheumatology clinic: An update on this great mimic. Int J Rheum Dis. 2016;19(10):941-5. doi: 10.1111/1756-185X.13023. [PubMed: 27792872]. 4. Tan SL, Neoh CY, Tan HH. 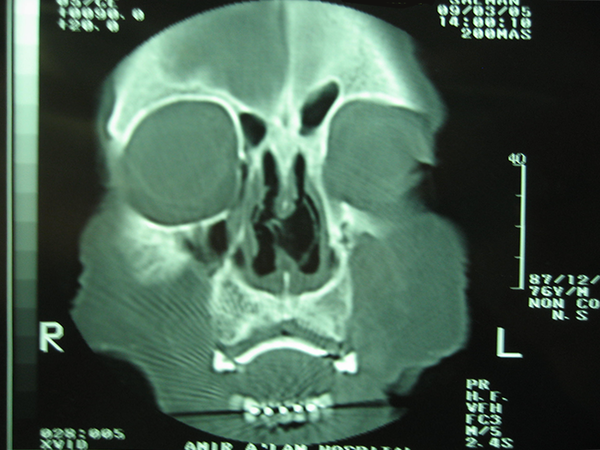 Rhinoscleroma: A case series. Singapore Med J. 2012;53(2):e24-7. [PubMed: 22337196]. 5. de Pontual L, Ovetchkine P, Rodriguez D, Grant A, Puel A, Bustamante J, et al. Rhinoscleroma: A French national retrospective study of epidemiological and clinical features. Clin Infect Dis. 2008;47(11):1396-402. doi: 10.1086/592966. [PubMed: 18947330]. 6. Ahmed AR, El-Badawy ZH, Mohamed IR, Abdelhameed WA. Rhinoscleroma: a detailed histopathological diagnostic insight. Int J Clin Exp Pathol. 2015;8(7):8438-45. [PubMed: 26339415]. [PubMed Central: PMC4555743]. 7. Catano JC, Gallego S. Rhinoschleroma. Am J Trop Med Hyg. 2015;92(1):3. doi: 10.4269/ajtmh.14-0288. [PubMed: 25568179]. [PubMed Central: PMC4347385]. 8. Verma G, Kanawaty D, Hyland R. Rhinoscleroma causing upper airway obstruction. Can Respir J. 2005;12(1):43-5. doi: 10.1155/2005/501457. [PubMed: 15776127]. 9. Fusconi M, Greco A, Cattaneo CG, Ciofalo A, Ralli M, de Vincentiis M. Social geography of Rhinoscleroma and qualitatively and quantitatively abnormal cell-mediated immunity. Infect Genet Evol. 2018;62:17-9. doi: 10.1016/j.meegid.2018.03.018. [PubMed: 29578083]. 10. Boushab BM, Fall-Malick FZ, Basco LK. Two cases of delayed diagnosis of leprosy in Mauritania. Case Rep Dermatol Med. 2018;2018:4394297. doi: 10.1155/2018/4394297. [PubMed: 29888012]. [PubMed Central: PMC5977048].